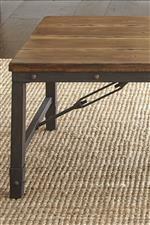 Featuring authentic detailing like rivets and metal cable stretchers, this cocktail table exudes industrial style. The iron base is topped by planked solid pine wood for a rustic feel. An Antiqued Honey finish completes the table, bringing a sense of warmth to the look and highlighting the natural wood grain. The Ashford Industrial Cocktail Table with Cable Stretchers by Steve Silver at Walker's Furniture in the Spokane, Kennewick, Tri-Cities, Wenatchee, Coeur D’Alene, Yakima, Walla Walla, Umatilla, Moses Lake area. Product availability may vary. Contact us for the most current availability on this product.